Here's a picture of the location of the Provincetown Airport. 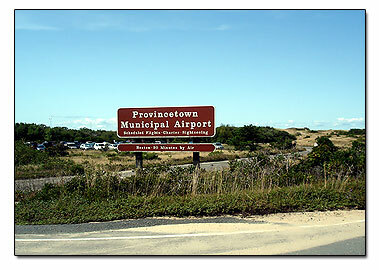 The Provincetown airport is next to Race Point Beach. Follow the link below to visit the Provincetown Airport website. From Provincetown Airport on Race Point Road, it is easy to find transportation for the short trip into the heart of Provincetown. There is a shuttle from the airport to MacMillan Wharf which runs every twenty minutes during high season, from early June to mid October, and local taxis are always readily available, only costing about $5 per rider. If you wish to rent a car for use during your stay in Provincetown, Enterprise rent-a-car is located on-site at the Provincetown Airport. It can also be reached at 1.800.736.8222 or locally at 508.487.0009. Although a bit more expensive than some other options, a Cape Air flight is the way to come to Provincetown in style. The view of Cape Cod's spiral meanderings as you approach Provincetown is breathtaking.